Brit Marling returns with the writer/director that helped put her on the big screen in the first place, Mike Cahill. Another Earth is a film that’s refused to leave my mind’s eye ever since I saw it back in 2011, so it’s awesome to see this pairing onscreen once more in yet another great piece of subtle science fiction. Michael Pitt plays Ian, a molecular biologist fascinated with the eye. When he has to supervise first year student Karen (Marling), the two of them inadvertently stumble across a discovery that will shock the foundations of both the scientific and religious world. That’s about as much as you need to know; to outline anything more of the plot would be to spoil a film that manages to surprise again and again. I Origins isn’t quite as consistent as Another Earth. That 2011 film had a clear, simple premise, and followed it doggedly to its conclusion. This is another story altogether. The narrative shifts more than once, and perhaps feels less cohesive as a consequence. Sometimes a romance, other times a work of science fiction or even a kind of medical thriller, the film is content to be a patchwork. As a kind of Pi lite however, it gets the job done. Pitt and Marling work well onscreen. As a couple of scientists pushing the boundaries of knowledge, they are more than a little reminiscent of Adrien Brody and Sarah Polley in Splice. Marling exhibits the kind of stillness that she’s become known for, whilst Pitt is good at playing the tortured, singularly-focussed scientist. Steven Yuen from ‘The Walking Dead’ is great in a small supporting role whilst Astrid Bergés-Frisbey (last seen as a mermaid in Pirates of the Caribbean: On Stranger Tides) brings an otherworldly presence to the role of Sofi, the object of Ian’s desires. I have to admit that the film is inadvertently amusing more than once. There are some extreme moments that feel out of place or unjustified by the narrative as a whole, and come off as unintentionally humorous. 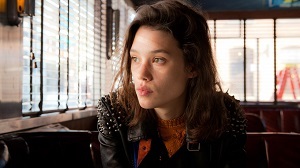 For those who enjoy a good provocative sci-fi, then I Origins might be for you. It mightn’t be as close to perfect as Another Earth, but there’s enough in there to have you talking about the film afterwards. I Origins is released in Australia on 11 September 2014. This entry was posted in Film Reviews and tagged Mystery, Romance, Science Fiction, Thriller by Stuart Wilson. Bookmark the permalink.